This disc contains all the music left to us in a complete state by William Cornysh the elder, and in so doing draws attention to the difference between the two composers named William Cornysh – the father and the son. The father is the composer of the Latin church music in the sweeping pre-Reformation style: the son, the writer of pieces in English and courtly songs. 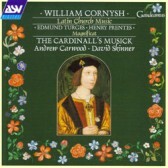 David Skinner’s research, printed in the CD booklet, provides the evidence and makes the connection between the Cornysh Magnificat and two other setting of the same text by Edmund Turges and Henry Prentes which obviously use Cornysh’s work as their model.